‘A “prize for the champions of peace, meaning Suttner, IPB and the movement for peace throughout cooperation on a disarmed brotherhood of nations” – as promoted by the peace congresses. 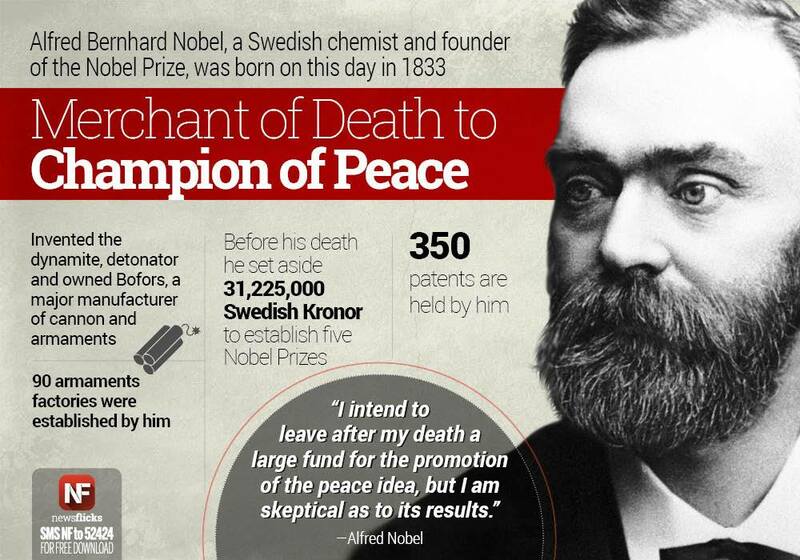 Nobel’s letters to Suttner leave no doubt that this was his intention and the, for eternity, legally binding, purpose of the prize.’ ~ Nobel Peace Prize Watch. The awakened world is still reeling in shock from the Right Livelihood Award being given to the US and NATO state construct, the White Helmets. The White Helmets have been proven to be no more than a support network for Al Nusra Front and associated extremist terrorist groups. In many documented instances, the White Helmets are more than a support group and have been accused of carrying out criminal acts alongside the recognised US coalition armed and funded terrorist factions. Ultimately, the White Helmets contravene all international laws regulating the behaviour of a proclaimed humanitarian NGO. In the following statement that will be presented to the board of the Right Livelihood Award, I lay out very clear evidence to support my argument that the RLA should be retracted and that the White Helmet’s Nobel Peace prize nomination is a travesty of what this prize should represent. STATEMENT REQUESTING THE RETRACTION OF THE RIGHT LIVELIHOOD AWARD, GIVEN TO THE WHITE HELMETS. My name is Vanessa Beeley. I am an independent investigative journalist, writer and photographer based in France. I contribute regularly to various independent media sites such as 21st Century Wire, the Ron Paul Institute, Globalresearch, Mint Press. I have recently returned from a four week stay in Syria from 24 July until 26th August. The first week, I went as a member of the US Peace Council delegation, and the subsequent three weeks I travelled independently to as many governorates as possible, including Aleppo, in order to continue my own investigation into the organisation known as the White Helmets. My conclusion, after my eighteen-month long analysis and research into this organisation is that they are a US and UK Foreign Office construct, funded and equipped by nations that have a proven vested interest in their stated policy of regime change in Syria & a clear geopolitical agenda in the region. The White Helmets claim to be neutral and ‘non-aligned,’ yet they actively promote and lobby for US/NATO state intervention, including a ‘No Fly Zone’ which violates Syrian sovereignty. The majority of legal scholars agree that enforcing a No Fly Zone is construed as an act of war. This is in direct violation of the fundamental principles which underpin authentic humanitarian work and certainly not deserving of the Rights Livelihood Award. I respectfully request that the members of the Rights Livelihood Award committee review their award of this prestigious award to the organisation known as the White Helmets. 1: The White Helmets receive funding from UK ($65m via UK Foreign Office), US (US State Dept via USAID $ 23m), Holland ($ 4.5m), Germany ($ 7.87m) and Japan (undisclosed sum from the Intl Cooperation Agency), Denmark (undisclosed sum) – via the Mayday Rescue “foundation” that was set up by the British ex-military trainer of the White Helmets in order to transfer funding to the White Helmets. The White Helmets also receive equipment and supplies from various EU member states. This funding is concealed behind the generic heading of “Emergency Health and Relief Support to the Population Affected by the Crisis in Syria”, through the Directorate-General for European Civil Protection and Humanitarian Aid Operations (DG-ECHO), formerly known as the European Community Humanitarian Aid Office. 2: The White Helmets were established in Gaziantep, Turkey, not in Syria. They are largely trained in Turkey and Jordan, not inside Syria. 3: The White Helmets are embedded exclusively in areas of Syria occupied by listed terrorist organisations including Nusra Front and ISIS, along with various associated ‘moderate rebels’ such as Ahrar al Sham and Nour Al Din Zinki. All these groups are responsible for carrying out ethnic cleansing operations and mass executions of the Syrian people. Nour Al Din Zinki was recently videoed beheading 12 year-old Palestinian child, Abdullah Issa. Like the White Helmets, all of these terrorist factions receive funding, training, equipment and support from the United States and its Coalition partners. A fact that is extensively documented. 4: During the situation in Madaya, Syria in January 2016, the White Helmets in Idlib were photographed attending demonstrations & carrying banners that were calling for the “burning and destruction” of the towns of Kafarya and Foua. These are two Idlib villages under full siege by Ahrar Al Sham & Nusra Front (Al Qaeda in Syria) since March 2015, partial siege since 2012. The siege ensures the starvation of villagers and daily shelling and sniping by Ahrar Al Sham and Nusra Front has killed over 1750 civilians during this time. 6: The White Helmets have been filmed “clearing up” after a Nusra Front execution of a civilian prisoner in Northern Aleppo. Although the official statement from the White Helmets claims they arrived after the execution, the speed with which they appear (in video) immediately after the prisoner has been shot in the head, demonstrates clearly that they were on the scene and did nothing to prevent it. 8: The leader of the White Helmets, Raed Saleh, was deported from Dulles Airport in the US, April 2016. No real explanation was ever given for this decision. Mark Toner of the US State Department fielded questions from media but did (i) Admit to funding the group with $ 23m and (ii) suggest that Raed Saleh might have “extremist connections”. Raed Saleh has recently been allowed back into the US in September 2016 and spoke at the UN New York with the Dutch Mission. However, no explanation has been given for this reversal of the previous decision to deport Saleh. 9: The White Helmets are also referred to as the ‘Syria Civil Defence.’ However, there is an existing Syria Civil Defence. The REAL Syria Civil Defence was established in Syria in 1953. I met with crews in Aleppo, Lattakia, Tartous and Damascus during my four weeks in Syria. The REAL Syria Civil Defence were founder members of the ICDO [International Civil Defence Organisation] which is affiliated with the UN, WHO, OCHA, Red Cross, Red Crescent. The REAL Syria Civil Defence are still paying annual subscriptions to the ICDO of 20,000 Swiss Francs. The REAL Syria Civil Defence do operate in both terrorist and government held areas, they operate with equipment that has been decimated by the war & sanctions and they do not receive up to $150 m in funding from the US, UK and EU states. The Real Syria Civil Defence are recruited and trained inside Syria. 10: During interviews with the REAL Syria Civil Defence, they informed me that the Nusra Front and associated ‘moderate rebels’ who invaded areas such as East Aleppo, Raqqa, Deir Ezzor, Idlib, massacred crew members of the REAL Syria Civil Defence and stole the majority of their equipment in those areas, including fire engines and ambulances. Many of these armed groups then became White Helmet operatives. Testimony from the REAL Syria Civil Defence suggests that the White Helmets are acting as support for Nusra Front, ISIS and other heavily armed militia described as “moderate rebels”. 11: On multiple occasions, the White Helmets have been exposed staging rescue scenes for both photo and video, recycling images of children and incidents from the conflict in Syria, to support their narrative, editing video which misrepresents the scene in question, using images from a previous incident or even fake images altogether. There are many documented instances of this. 12: The White Helmets have been filmed describing Syrian Arab Army bodies as “trash” and one particular video shows them standing on top of a pile of SAA soldier’s bodies, whose boots have been removed or stolen. The White Helmets talk about the bodies in pejorative terms and they flick a victory V sign as the truck drives off. 13: There are many images documented, that reveal the White Helmet operatives carrying arms or posing with arms alongside the various armed militia including Nusra Front. There is also further footage from Idlib showing White Helmet operatives celebrating alongside Nusra Front militia after the massacre of Syrian Arab Army forces and Syrian civilians during this attack. 14: Adulatory publicity about the White Helmets is the result of a multimillion dollar sustained commercial marketing and social media promotional campaign via a network that is funded by George Soros and various US, UK and Middle Eastern enterprises. The PR network is as follows: Avaaz – Purpose – Syria Campaign – White Helmets. The funding connects back to these organisations and US State-funded entities who have a vested interest in events in Syria. This is also extensively documented. 15: Analysts have observed, the White Helmets achieve on average 4 or 5 videos per day, depicting their heroic rescue efforts. The REAL Syria Civil Defence have evaluated these videos and cast doubt as to the White Helmets being true first responders or USAR (Urban Search and Rescue) experts. They pinpointed various anomalies (i) the equipment used is too heavyweight for the delicate operation of finding bodies beneath collapsed buildings (ii) the treatment of injured bodies is dangerous, they are flung onto stretchers with no back support or neck brace, for example. Many of the paramedic procedures shown on film are also deemed questionable. The White Helmets rarely travel without a sizeable camera team or crew of mobile phone cameramen. The REAL Syria Civil Defence do not. 16: While in Aleppo, I conducted a short video interview with Dr Bassem Hayak of the Aleppo Medical Association, based in West Aleppo. Dr Hayak still has family trapped in East Aleppo. Dr Hayak told me that his family and the majority of civilians in East Aleppo (occupied by Nusra Front and an estimated 22 brigades of armed militants) do not know who the White Helmets are which begs the question, where are they conducting their much promoted humanitarian work? Dr Hayak also said that UN agencies in East Aleppo who work with the Aleppo Medical Association are not aware of the White Helmets. 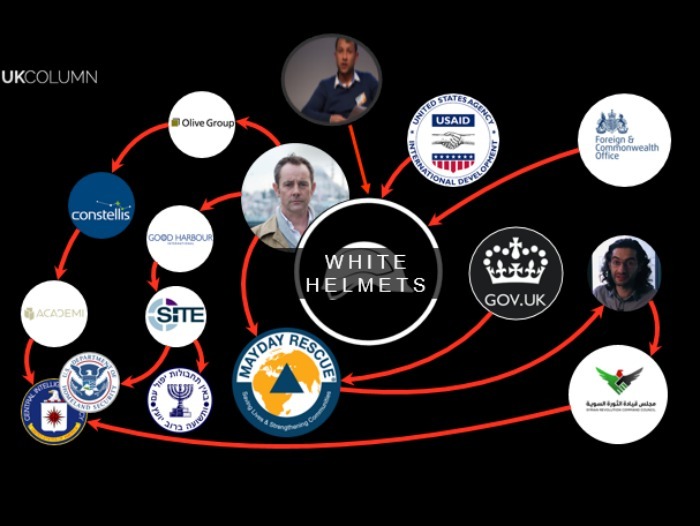 In summary, this evidence points to the White Helmets being a US, UK, EU creation established in 2013, and not an independent NGO. It is a multi-million dollar US Coalition funded organisation. It is funded by governments involved & invested in the Syrian conflict. No one can rightly call this a grass-roots Syrian organisation. There is an existing Syria Civil Defence that is being ignored by western media. Running parallel there is a vast fund raising network constructed to collect money which is funnelled into the pseudo White Helmets designed to replace the authentic Syria Civil Defence in the minds of the western public. The REAL Syria Civil Defence is crippled by US and EU sanctions, the White Helmets have never been affected by these sanctions, their supply chain via Turkey is unbroken. Conservative estimates put White Helmets funding at over $150 million thus far, which is far more than any real NGO would ever require in a decade, much less 3 years. Tax payers in funding countries have a right to know precisely what their money is funding. The evidence demonstrates that the White Helmets are sectarian not impartial. They are in many instances, armed not unarmed. The promotional material produced for the White Helmets such as the recent Netflix documentary film, is often produced outside of Syria, usually in Turkey, and with any field footage supplied by the White Helmets. Who has verified the authenticity of this footage, or photographs? Effectively, this organisation campaigns for an escalation of war in Syria. Many of their ‘campaigns’ have since been discredited as “war fiction”, and yet they are being used by the US Coalition as justification for continuing and increased economic and diplomatic sanctions, sanctions which are a collective punishment on the Syrian people, while the US coalition persists with equipping and arming the various militia on the ground in Syria, including Nusra Front (al Qaeda in Syria). This only serves to ensure even more suffering and bloodshed inside Syria. The presentation of the Right Livelihood Award to the White Helmets will ultimately discredit the Right Livelihood Foundation. More crucially, the awarding of this prize to a suspect and fraudulent organisation serves to perpetuate a western-sponsored conflict in Syria which has only delayed the possibility of any real peaceful resolution. We call on the leaders of the Right Livelihood Foundation to investigate the evidence presented in this statement and to retract the RLA award, if this evidence is proven sufficient to disqualify the White Helmets. Thank you for your consideration of this very important matter.